Science writer Adam Becker begins his tremendously appealing new book What is Real? 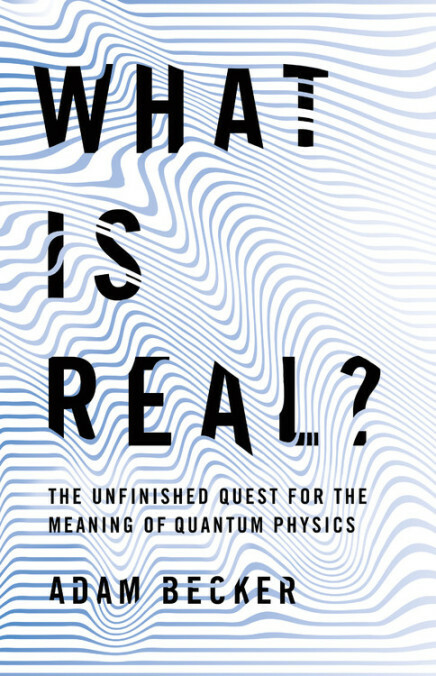 The Unfinished Quest for the Meaning of Quantum Physics in the only place this kind of book really can begin: with German physicist Erwin Schrödinger and a dead cat. The feline in question, known far afield of the physics world, is Schrödinger's Cat, and it stars in a thought experiment designed to illustrate one of the most peculiar aspects of quantum physics. A cat (several physics-popularizers gratuitously refer to the animal as an “innocent” cat, although the smarter half of humanity knows this is a categorical impossibility) is placed in a box along with a small mass of radioactive material connected to a Geiger counter. If the Geiger counter detects radioactive decay, it trips a hammer that shatters a vial of poison, killing the cat. Since the radioactive decay is totally random, there's no way for an outside observer to know the state of the cat unless that outsider observer opens the box. In the world-view of quantum physics, prior to the opening of the box the cat is in a superposition, a floating cloud of possibilities that include both living and dead. Its final state is not only observed by opening the box – it's determined by opening the box. Or so went the Copenhagen interpretation, which seemed to make alarming implications about a universe that doesn't quite exist in the traditional fixed sense of the term unless it's being watched. And flowing from that was another ramification of quantum physics, equally alarming: two quantum particles, having once interacted with each other, are entangled forever – alter the spin or position of one, and the spin or position of the other is simultaneously altered, regardless of the physical space separating the two. This flies in the face of several settled, accepted understandings of physics, including the unmovable ceiling of the speed of light – leading Albert Einstein, among others, to contend that since cause must always precede effect and things must always travel to their destinations in order to reach them, something must be rotten in the state of the quantum understanding of reality. Surely, objectors asserted, there must be some kind of hidden information tipping off the whole process. But decades of experimentation have shown that such hidden variables don't exist – and that, therefore, the fundamental bedrock of all reality is a constant, baffling fizz of not-quite-reality. Of course Becker knows better than anybody that the question posed in the title of his book currently has no answer. Indeed, the blame for the lack of an answer can be laid squarely at the doorstep of quantum physics, which is eminently testable and predictable and confirmable but completely refuses to be comforting. But reading What is Real? will give you a toehold, at least. This is our story so far.